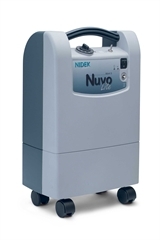 Nuvo Lite Oxygen Concentrator: This Concentrator is easy to use, easy to carry and easy to maintain. The locking dial-style flow-control valve is much more precise and easier to use than standard flow meters, and the filters are easy change. Weighing only 30 pounds, it's among the lightest and most portable concentrators available. It features a reliable high-quality Thomas compressor; built-in pediatric settings (liter flow 0.125, 0.25, and 0.5 LPM increments up to 5 LPM) Specifications: Specifications: Average Power Consumption 310 watts; Size 14" (35cm) W x 9" (23cm) D x 23" (58cm) H; Weight 13.6 kg (30 lb. ); Oxygen Concentration (at 5 LPM) 90% (+6.5% / -3%); Liter Flow 0.125 to 5 LPM; Sound Level: 40 dBA typical; Outlet Pressure 7.0 PSI. -Thomas Nexus Compressor with Integrated Pressure ReliefValve with Long-Life Steel Spring Mount with "Quick Snap" compressor plate. -Rotary Poppet Valve: a patented design. Direct acting and vertical movement. Instead of using a system that is dependent on P.C. boards, transformers and wiring.we developed a completely different process control system that is simple, compact and reliable. -Humidifier Outlet: Recessed design to prevent equipment damage. -Easy Glide Casters: Furniture grade casters allows unit to be easily rolled on all surfaces. 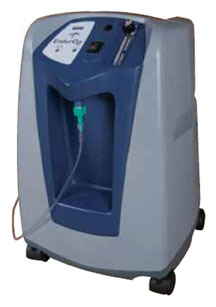 The smallest and lightest, continuous 5-liter concentrator weighing only 40.4 lbs. The footprint is less than 1-1/4 sq ft and the wheels are set wide for stability. Carrying handles on top and on each side make for easy mobility. 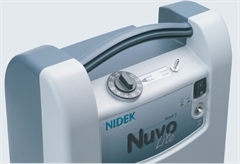 Top-located power switch and reset buttons allow you to turn the machine on and off without bending down to look at the front of the unit. Instrument panel is set at a 65 degree angle for easy viewing of indicator lights, flow gauge, and hour counter. All three filters are within easy reach. Simply remove the air intake cover - no tools necessary. 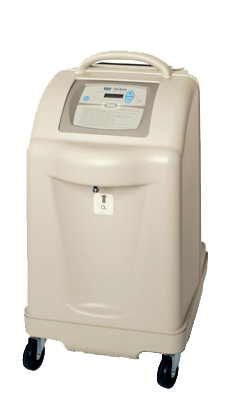 Integra E-Z Oxygen Concentrator: 10L oxygen monitor measures purity and flow. Wheels and carrying handle help make it easy to maneuver. 110 VAC, 60 Hz. 3-year warranty. Copyright© 2003- CPR Savers & First Aid Supply LLC. All Rights Reserved.